In the first action on the merits of an application, the examiner must record in the appropriate sections of the OACS or Official Correspondence "Search Notes" form the areas in which the search for prior art was made. The examiner must also indicate the date(s) on which the search was conducted and provide his/her initials. In subsequent actions, where the search is brought up to date and/or where a further search is made, the examiner must indicate that the search has been updated and/or identify the additional field of search and include the date and the examiner’s initials in the appropriate sections of the "Search Notes" form. Any search updates should include the appropriate databases and the search queries and classifications employed in the original search. See MPEP § 904. Great care should be taken so as to clearly indicate the places searched and the date(s) on which the search was conducted and/or updated. In order to provide a complete, accurate, and uniform record of what has been searched and considered by the examiner for each application, the U.S. Patent and Trademark Office has established procedures for recording search data in the application file. Such a record is of importance to anyone evaluating the strength and validity of a patent, particularly if the patent is involved in litigation. Searches are listed in the "SEARCHED" boxes and/or "SEARCH NOTES" box of the "Search Notes" form. 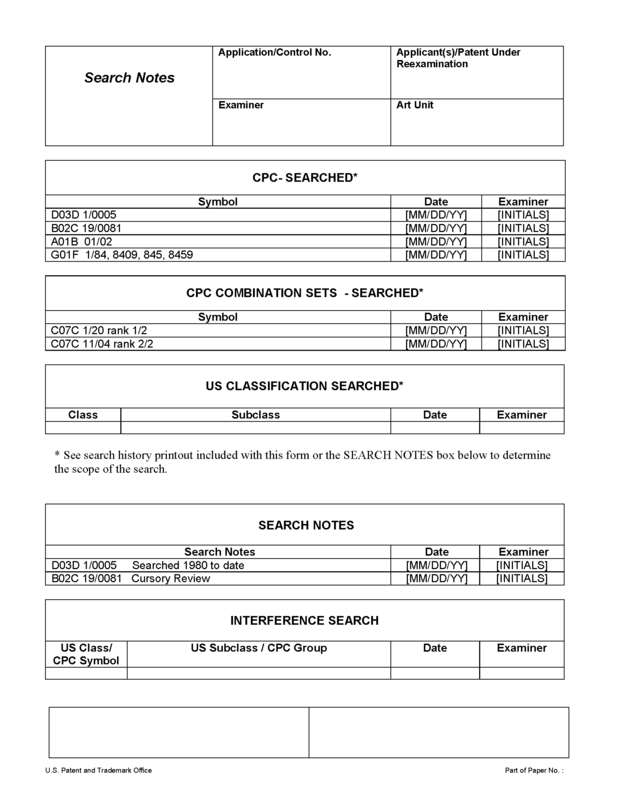 For example, in the sample "Search Notes" form reproduced below, the "SEARCH NOTES" box indicates how the Search was limited for documents classified under CPC symbols D03D 1/0005 and B02C 19/0081. The absence of entries in the "SEARCH NOTES" box for the other classification symbols searched indicates that all documents having those symbols were reviewed or there is a search history printout in the file indicating how the search of those symbols was limited. As provided in subsection II.B below, a complete search history in the form of a printout must be included in the application file any time an electronic search was performed. The Search Notes form includes three "SEARCHED" boxes for recording searches in Cooperative Patent Classification (CPC), CPC Combination Sets and U.S. Patent Classification (USPC). When documenting a classification search, as described below, the examiner should ensure the proper box(es) is/are used. A classification search is defined as a search of the documents in a particular classification location, whether classified by CPC or USPC, and may be limited by a text query, filters or other means. When a classification search is performed, the classification symbol must be recorded in the appropriate "SEARCHED" box section of the "Search Notes" form along with the date that the search was performed (or updated) and the examiner’s initials. When a classification search is limited, the examiner must ensure that how the search was limited is made of record. In most situations, how the search was limited would be apparent in a search history printout and in these situations, the examiner should include the printout with the "Search Notes" form when making the "Search Notes" of record. When the search is limited by an approach not apparent in the search history printout, the manner in which the classification search was limited should be made of record by annotating the "SEARCH NOTES" box. Unless a search of all of the documents for a particular classification location was performed, it would be inaccurate to merely record the classification symbol in the "SEARCHED" box without including the search history printout or indicating how the search was limited in the "SEARCH NOTES" box. Entries made in the "SEARCH NOTES" box are of equal importance to those placed in the "SEARCHED" box. They are intended to complete the application file record of areas and/or documents considered by the examiner in his or her search. The examiner will record the following types of information in the "SEARCH NOTES" box and in the manner indicated, with each entry dated and initialed. (A) Annotations indicating how a classification search was limited, as discussed in subsection I above. (B) Text search performed in a particular database where no classification search was performed. If a text search was performed in a particular database and no classification search was performed, the following entry or its equivalent must be recorded in the "SEARCH NOTES" box of the "Search Notes" form: "See search history printout(s)" along with the date or dates that the search was performed (or updated) and the examiner’s initials. A search history printout must also be included in the file. See subsection II.B below. (C) Searches made within the International Patent Classification System (IPC). (D) Searches performed by the Scientific and Technical Information Center (STIC). The staff of the STIC provide non-patent literature (NPL) and foreign patent searches to examiners on request through the Electronic Information Center (EIC) located in each Technology Center. STIC staff use commercially available databases to provide text, chemical structure, sequence, litigation, inventor, and other types of searches. To request a search, the examiner must fill out and submit a search request form via the STIC NPL Web page. It is important to provide as much relevant information as possible to assure that the search meets the examiner’s needs. Examiners are encouraged to fill out the request form completely and/or to discuss their search needs with the EIC search staff. The full text of any citations included in the search results will be provided at the examiner’s request. The search conducted by the EIC will include a complete search history. The complete search history in the form of a printout must be included in the application file. The following entry or its equivalent must be recorded in the "SEARCH NOTES" box of the "Search Notes" form: "See search history printout(s)" along with the date that the search was performed (or updated) and the examiner’s initials. EIC search staff can also assist examiners in conducting their own search of NPL databases. (E) A consultation with other examiners to determine if relevant search fields exist in their areas of expertise. If the subclass is not searched, record the class and subclass, if any, discussed, followed by "(consulted)." This entry may also include the name of the examiner consulted and the art unit. (F) Searches performed in electronic journals and electronic books available to examiners on their desktop through the STIC NPL website. Examiners should contact their EIC if they need assistance using these tools and creating a search history printout. (G) Searches performed in other media collections or databases (e.g., CD-ROM databases, specialized databases, etc. ), record data as necessary to provide unique identification of material searched and sufficient information as to the search query or request so that the search can be updated. The record should also document the location of the database and its form (CD-ROM, etc.). Entrez: Sequences, National Center for Biotechnology Information, Version 7.19.91b (CD-ROM, TC 1600) Searched HIV and vaccine; neighbored Galloway article dated 6/5/91 on April 1, 1990. Computer Select, (November, 1991), Ziff Davis Communications Co., (CD-ROM, STIC), Searched Unix and emulation on December 1, 1991. (H) Searches performed on the Internet. For Internet search engines, such as Google®, Yahoo®, and Bing®, print out the first page and any of the following pages that include names of any Web pages reviewed during the search. Use the print icon on the Microsoft Internet Explorer® toolbar or use the file-print command. Review the printout to determine if the Internet search engine name, the search logic, and the date of the search are present. If any of these are missing, write the missing information on the printout. Indicate all Web pages reviewed. (1) Abstracting publications, such as Chemical Abstracts, record name of publications, list terms consulted in index, and indicate period covered. (2) Periodicals — list by title, volume, issue, pages and date, as appropriate. (3) Books — list by title, author, edition or date, pages, as appropriate. (4) Other types of literature not specifically mentioned herein (i.e., catalogs, manufacturer’s literature, private collections, etc.). Record data as necessary to provide unique identification of material searched. Sears Roebuck catalog, Spring-Summer, 1973. A cursory or browsing search through a number of materials that are not found to be of significant relevance may be indicated in a collective manner, e.g., "Browsed STIC shelves under QA 76.5" or "Browsed text books in STIC relating to......................" More detailed reviews or searches through books and periodicals or any search of terms in abstracting publications should be specifically recorded, however. (J) A review of art cited in a parent application or an original patent, as required for all continuation and continuation-in-part applications, divisional applications, reissue applications and reexamination proceedings, or a review of art cited in related applications. Record the application number of a parent application, followed by "refs. checked" or "refs. ck’ed." If for any reason not all of the references have been checked because they are not available, such exceptions should be noted. Record the patent number of a parent or related application that is now patented or of an original patent now being reissued with "refs. checked" or "refs. ck’ed." (K) A review of documents cited in a related trial before the Patent Trial and Appeal Board. Record the trial number, U.S. Patent on trial and date reviewed. (D) an indication of the examiner who performed the search (e.g. a user ID or the examiner’s initials). It would be improper to merely list the tool/database, e.g., "EAST" or identify the search queries in the "SEARCH NOTES" box of the "Search Notes" form. A search history printout should be devoid of result printouts to limit the "bulk search printouts." Regarding nucleotide and peptide sequence searches, these searches must be documented by printout(s). A copy of a printout for each database source searched must be included in the application file. Each printout must include all the information up to the "ALIGNMENTS" section. Most of the database services accessed in application searches provide a command to display or print the search history which includes most, if not all, of the minimum required information for documenting database searches. Table 1 below lists the history command for each database service and the required minimum documentation elements included when the history command is entered. Any missing elements may be documented by writing them on the printout of the search history or by supplying further portions of the search transcript which do include the missing elements. If there are several search statements in the history, the statement or statements of which the results were reviewed should be indicated. *Examiners may acquire user’s manuals for EAST and WEST through the Office of Patent Automation website. Assistance for other electronic database searches may be acquired from the staff of the STIC-Electronic Information Centers (EIC). History Command - Generally, a display of what the user has asked the search software to do will display the search logic entered by the user. Some histories are limited to display of the searches done only in the current file while others deliver a complete record of what file or files were accessed and all searches done since sign on. Name of Database Service - This is the name of the database service (i.e., EAST, IEEE Xplore) used to perform the search. Search Logic - Generally, a display of the search commands executed by the search software. For a structure or sequence search, this can be a printout of the structure or sequence used to query the system. Name of File(s) Searched - The name of the collection(s) of data accessed. Date of Search - Dialog and Questel-Orbit do not display the date of search as part of the history command. Dialog and Questel-Orbit supply the date of search during log off. For WEST examiners should use the eRF search history options. When an application is in condition for allowance, an interference search must be made by performing a text search of the "US-PGPUB" database in EAST or WEST directed to the comprehensive inventive features in the broadest claim. If the application contains a claim directed to a nucleotide or peptide sequence, the examiner must submit a request to STIC to perform an interference search of the sequence. Completion of the interference search should be recorded in the "INTERFERENCE SEARCH" section of the "Search Notes" form with an identification of the manner in which the interference search was limited (if any) in the "Search Notes" by providing an appropriate annotation. A printout of only the database(s) searched, the query(ies) used in the interference search, and the date the interference search was performed must be made of record in the application file. The result printouts of the interference search must not be placed in the application file. For an indication of consideration or nonconsideration of prior art citations submitted by applicant in Information Disclosure Statements (37 CFR 1.97 and 1.98 ), see MPEP § 609 et seq.